Join En Masse Entertainment Community Manager, Tonka, and the TERA: Rising community for Skyring Slam! This first-ever 3v3 PvP battleground tournament event will be a 32-team single-elimination brawl in Champions’ Skyring, taking place on Saturday, March 8 and Sunday March 9. When: 10:00am to 2:00pm (Pacific) on Saturday, March 8 and 10:00am to 1:30pm (Pacific) on Sunday, March 9. Prizes: First place team members will earn 3,000 EMP (En Masse Points, used to purchase items from the En Masse store, Valkyon Outfitters) and a premium ninja costume bundle. Second place team members will earn 1,000 EMP and a ninja costume bundle. Third and fourth place team members will also receive a ninja costume bundle. 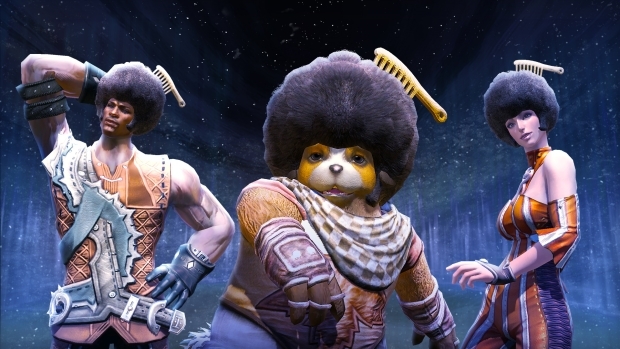 All contestants will receive an amazing afro head-slot accessory just for participating. Plus Twitch viewers will have the chance to win some fun prizes for checking out the show.